Delightful, heart-warming, inspiring, magical stories from one of the top animal communicators in the world! This first 2-CD set of Stories begins over 20 years ago with the newly-professional telepathic interspecies communicator, Elizabeth Severino, having no idea what to expect. How will animals she's meeting for the first time, feel about speaking openly with her? Will an animal ever refuse to talk to her? How will she manage what and how she tells the people, from all that the animals have to say? Will the animals continue to be open to her and to teach her? The stories are filled with warmth, humor, pathos, drama, and Elizabeth Severino's love of animals and sweet appreciation of and fascination for All Life. 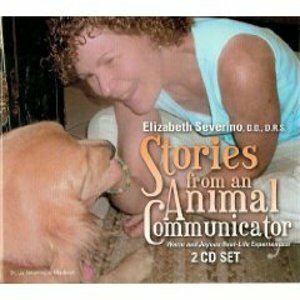 Stories from an Animal Communicator is lovingly told by the author, along with K. Scott Teeters, Cat Korman, Mario Pinardo, and numerous dogs and cats, horses and hawks, crickets and snakes, a tortoise, alligators, hermit crabs, and more. 2-CD's. Total running time: 90:15. Dr. Elizabeth Severino, D.D., D.R.S., is a former Fortune 500 executive, best-selling co-author of Wake Up ... Live the LIfe You Love: Stories of Transformation, and author of the widely-acclaimed book, The Animals' Viewpoint on Dying, Death, and Euthanasia. An internationally renowned advanced healing communicator for People and Animals, she is a true Renaissance Woman: an animal communicator since birth, she is also an intuitive advisor, lecturer, author, workshop leader, spiritual healer, poet, linguist, ballroom dancer, choreographer for both ballroom and opera, artist, singer, computer-whiz, and musician. Her accomplishments are chronicled in dozens of Who's Who books in the U.S. and elsewhere, including International Leaders of Achievement published in Cambridge, England.